Should residency programs review their applicants' social media history? The website Canary Mission documented numerous tweets expressing similar thoughts. She has apologized but will likely have great difficulty finding another job as a physician. Numerous replies, both against and for, were also received. Some were worried that screening for social media activity would take too much time due to the large volume of applicants and the amount of material already requiring review. That objection could be countered by only examining the social media activity of candidates selected for ranking in the match. Others were concerned about potential bias involving applicants’ political opinions, religious affiliations, or other activities. I believe most program directors and physicians, in general, are fair and would only be concerned with egregious cases. A handful of people felt using the example of the resident from the Cleveland Clinic as a basis to review every applicants’ social media is wrong because she wrote the tweet about giving Jewish patients the wrong medication in 2012 when she was younger. But she would have been at least 20 years old then. Furthermore, Canary Mission listed more than 110 anti-Semitic tweets some of which were posted as recently as 2017 when she was still in medical school. The situation highlighted the importance of educating medical students and residents about the use of social media. As one responder noted, medical students should assume program directors are googling them. Many employers are doing the same. Here’s an illustration. My son was looking to hire someone to teach swimming to children. A young woman interviewed well. However, when he Googled her, the first post he found was one in which she said she hated kids. She did not get the job. A few thought looking at applicants’ social media activity was reminiscent of the novel 1984. I pointed out that what is going on today seems different because the information has already been made public by the individual. There should be no expectation of privacy. Despite disclaimers by those tweeting that their views do not represent the views of their institution, the public doesn’t necessarily accept that premise. What a trainee says on social media can reflect negatively on the program and the hospital. 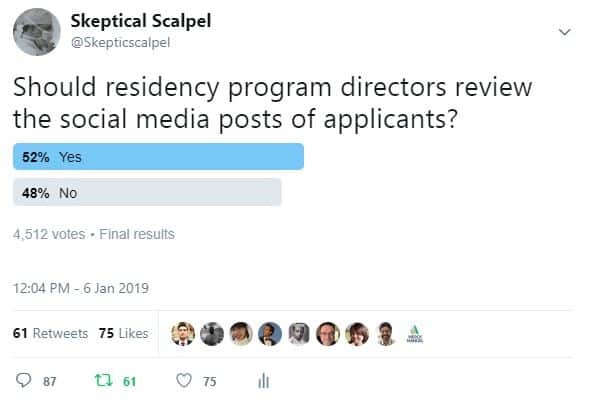 To paraphrase a tweet by @ThePhoenixMD1: I’ll bet the Cleveland Clinic program director wishes they had looked a little harder at their applicants’ social media footprints before submitting the rank list. Forget about the Twitter poll’s almost even split of votes. The reality is the posts are there for all to see.